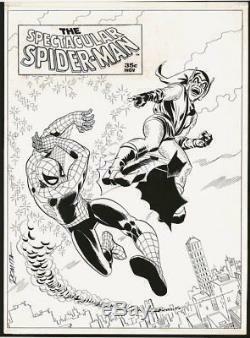 SPECTACULAR SPIDER-MAN #2 LINE ART COVER (LARGE ART) 1968. John Romita Sr - Pencils And Inks. What you are witnessing here is the largest, and arguably the GREATEST Silver Age Spider-Man / Green Goblin LARGE ART battle cover images ever drawn by the great John Romita! RARE is an understatement for this historic piece right here! This piece is the ONLY 1960's Large art penciled and inked images ever created by the great John Romita that feature Spider-Man AND the Green Goblin in all out battle where both the hero and villain are prominently shown together battling! The ASM 39 cover has no Spiderman drawn on it and the ASM 40 cover features the Green Goblin on his hands and knees with his head down and his face not even shown! And both splash pages to ASM 39-40 books do not have both characters pictured together in full costume, much less with any battle action, such as with this masterpiece! 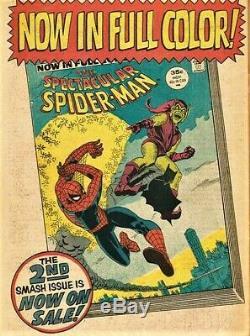 This cover quality image was originally drawn to be the Silver Age cover to The Spectacular Spider-Man #2 Magazine. It still has the original 1960's Stat logo AND the original 35 cent price tag stat still attached to the cover art. This great piece was ultimately replaced by a painting for the Spectacular Spiderman #2 Magazine to promote higher sales since the book went to color art for issue #2. This great image was instead published as a FULL PAGE PINUP in EVERY MARVEL comic book in 1968 to "promote" the Spectacular Spider-Man #2 Magazine. 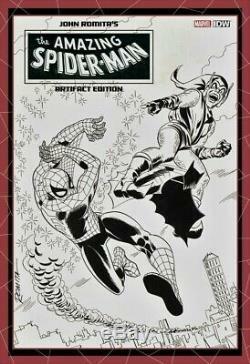 This great image was so highly thought of that is was used AGAIN a 3rd time, as the FRONT COVER for the IDW John Romita ARTIFACT EDITION book, which was a highly sought after IDW book showing all of Jazzy John Romita's Greatest, LARGE sized covers, splashes, and pages from John Romita's Amazing Spider-Man #39-53 run of LARGE ART pages! This one-of-a-kind piece of Marvel history should be in a museum..... But you can add this gem to your private collection right now! WE SELL MORE HIGH QUALITY ORIGINAL COMIC ART THAN ANYONE IN THE HOBBY, WITH OVER 30 YEARS EXPERIENCE & TOP NOTCH CUSTOMER SERVICE! Overseas orders are ALL sent via FEDERAL EXPRESS, and cost is 100.00 for up to 10,000 Value of art. Please message us for a speedy reply! The item "ROMITA, JOHN SR SPECTACULAR SPIDER-MAN #2 LINE ART COVER (LARGE ART) 1968" is in sale since Tuesday, March 12, 2019. This item is in the category "Collectibles\Comics\Original Comic Art\Other Original Comic Art". The seller is "romitaman" and is located in Ravenna, Ohio. This item can be shipped worldwide.